Due to its unique location next to the central train station and a few minutes from the A15, A50 and A73 highways, accessing the hotel is easy. Radboud University and Radboud UMC are just 10 minutes away by car. The city center is a 5-minute walk away. The area around Nijmegen is perfect for leisurely walking or cycling trips in the Ooypolder, Betuwe or the Reichswald forests. The lively city offers plenty of shops to explore, exceptional museums and many pubs for a perfect evening out. I spent few days in Nijmegen for attending a workshop. The event was hosted in the city center and I was traveling by train, so choosing the Mercury hotel just at the side of the Nijmegen cetral station was easy. Now I can say it was also wise and efficient, because I could reach all places of interest by walking 10-15 minutes. The room was clean and in order and the internet connection was always working smooth (both speed and strength of signal), which is a plus while working abroad. I had nice breakfasts in the morning and the hotel staff was always professional and kind. Minor remark is about the noise insulation of the room. Very relaxing and comfortable after a hard days work. Staff are very pleasant and the breakfast menu is extensive. Very friendly staff. Comfortable room. Location is convenient, right next to Central Station. Staff were exceptional and welcoming. My room was clean and serviced well for the duration of my stay. Always a pleasure to stay at this hotel with there great team. Nothing is too much to ask of the team they are always doing that little extra to help. Even though small the room was very well designed. Very polite staff. Nice “touch” that you gave apples and candy outside the elevator. Very good location. Why not, maybe expected more. The people at the reception were perfect!Expected to have slippers, bath hat and a set to remove the make up. Did not like that had plastik cup only for the first and last day.Didn'like that during cleaning the things from the room were moved, not like i left it, like the chair from the window side was moved to the door side, why?The same with the bed, i had put both together, each day they were separeted.The newspaper from the bath(where i left it) was placed on the table in the room. There was a draft from the windows.I found them open from time to time.The power of the heater was changed too. Perfect location. Good breakfast. Clean room. Good wifi. Enough parking space. Nice employee. Nice renovated bathrooms with toilet , real fan and nice shower. Only minus is water spread from shower to the rest of the bathroom to easy making the floor at the toilet area wet and also subsequentially the bathroom floor is wet and cold. .. bigger or thicker floormat would help. Great accommodations. Staff were wonderful. Food was awesome. The sauna was SO relaxing. Rented a bike from the hotel, and made my stay fantastic. Very convenient to train station-right next door. Would highly recommend!! Nice motel, great location:) enjoyed Nijmegen! Very good! The hotel is located conveniently for the city centre and for train & bus services. My room was very comfortable and well equipped. Breakfast was good. The staff were friendly, efficient & helpful. I would definetely recommend it to other people. 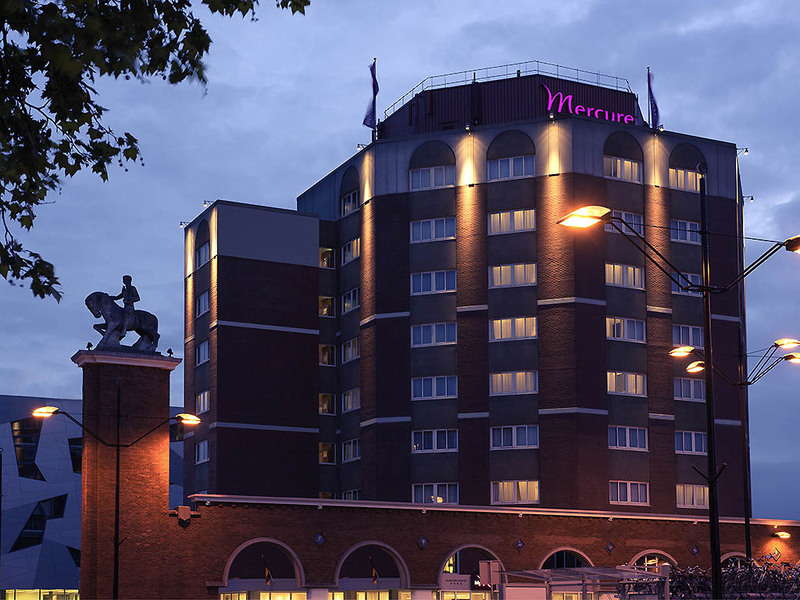 I always enjoy coming to the Mercure Nijmegen. I'm traveling for business and it's always nice to rely on a nice and quiet place to stay. The staff is very nice and friendly and has specific attentions. Breakfast is also nice and very good to start a day. I spent 3 nights. The hotel clerk at check in was very welcoming and helpful. The room, 216, was clean and comfortable. I ate one evening meal at hotel which was convenient. The choices were very limited. Meal was satisfactory. The room was OK, breakfest fine. On the other hand location of my room was from railway station side therefore very noisy. Really lovely.. comfortable...... friendly hotel. Loved everything about the hotel...staff were great..very friendly and helpful. Food was great... dinner gorgeous and breakfast perfect. Ideal location for us. Also felt very safe and secure during our stay which is very important to me when visiting an unfamiliar city.